If we’re being honest, I totally cheated on y’all and watched two more episodes of PLL when I should have written a blog post, and then went out and got food and judged people in public and it’s 10 PM on Friday night and I can’t think of anything else. Someone please sell me stories. ^ on that note, Jessie and I went out for dinner and dessert at a nearby outdoor mall known for its ritzy shops and Barbie-esque women. I used to work at a yogurt shop in there and fondly remembered the days when froyo was a main food group of mine and reminisced at the large selection of toppings until some kid spilled his yogurt on the floor and I reflected on the time I found a BLOODY TOOTH in the bathroom sink. Then I didn’t like it so much anymore. Yes. I found a bleeding tooth in the bathroom sink of that yogurt shop. Yogurt, if you didn’t know, is like the softest food ever. Baby food is harder than yogurt and babies don’t even have teeth, just those really weird & strong gums. How someone A) lost a tooth and B) decided to leave said tooth abandoned in the sink of a public restaurant, was beyond me. Anyway, let’s just get to the real reason we’re here, mmkay? I am awesome and you all collectively joined to tell me so. But these bars. Oh man, these bars! 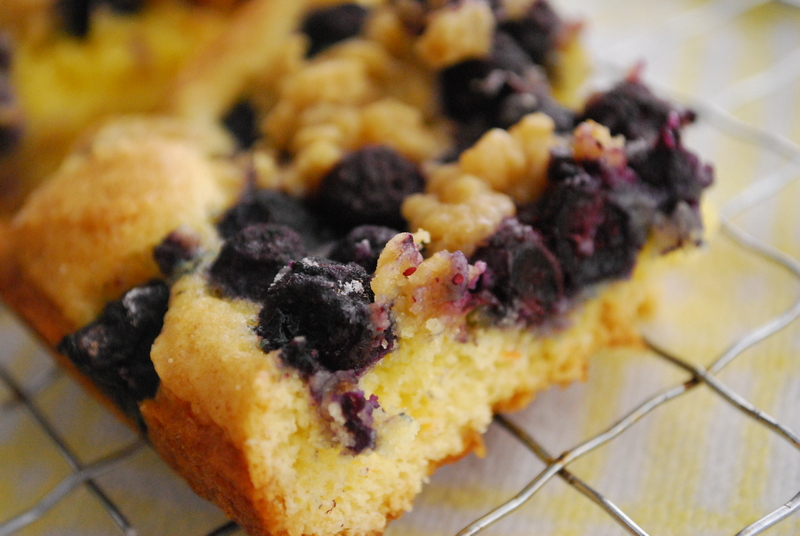 Blueberry Streusel Bars if you wanna be technical. Or better known as The Most Awesomest Bars in the World. 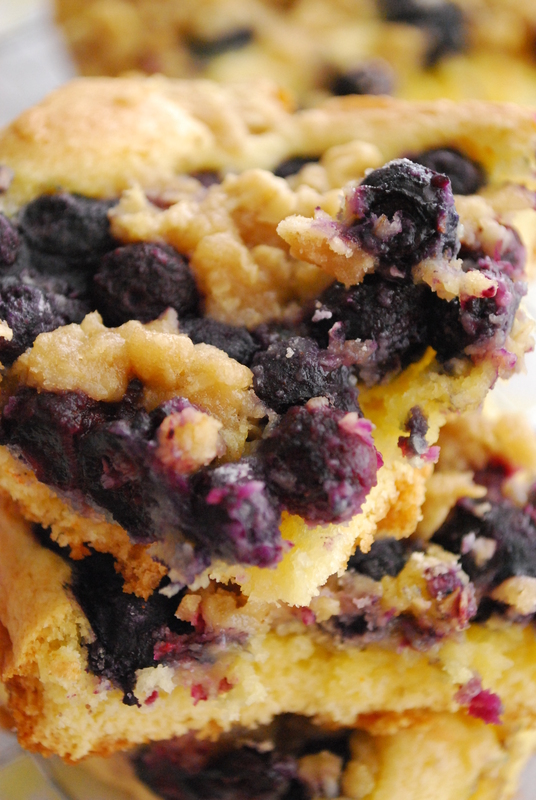 Here’s the story, Wishbone: it’s a gooey butter cake layer, topped with a blueberry & cinnamon sugar layer with a brown sugar and oat crumble on top. SO. PERF. 2. In a large bowl, combine the cake mix, eggs, the stick of melted butter, and the lemon juice until a thick yet soft dough forms. Spread the entire mixture evenly into the bottom of the pan. 3. Meanwhile, in a small bowl, toss together the blueberries, the Tablespoon of flour, and the Tablespoon of cinnamon sugar together lightly. Spread the blueberry mixture evenly on top of the dough in the pan. 4. In another small bowl, lightly mix the remaining flour, brown sugar and oats together; cut the remaining 2 Tablespoons of cold butter into the flour mixture with a fork or pastry blender until it resembles coarse crumbs. 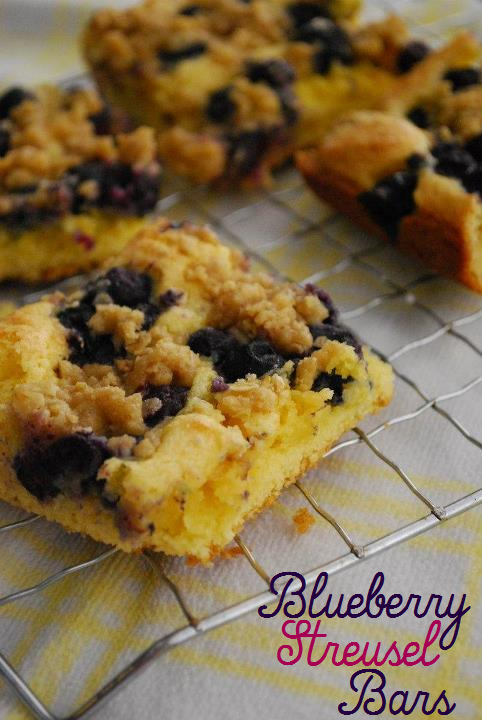 Sprinkle chunks of the crumbs on top of the blueberry layer evenly. 5. Bake for approx. 15-18 minutes (mine took about 18) until the top is golden and the center is just about set. Do not overbake. Cool completely in the pan before cutting into squares to serve. Store leftovers airtight at room temperature for a day. 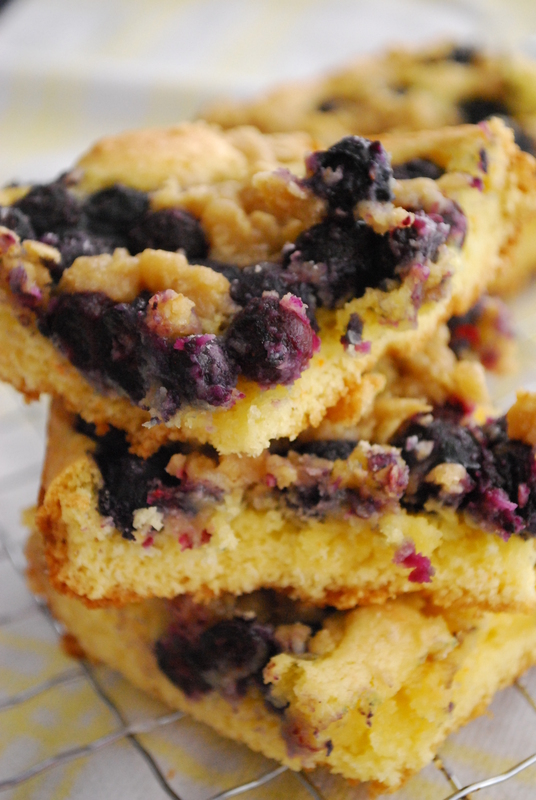 This bar is versatile because it reminds me both of a blueberry coffee cake for breakfast and as a refreshing summer dessert for a picnic or BBQ. The brown sugar mixed with the blueberries is unexpected and delicious and anything with ‘streusel’ or ‘crumble’ in the title has me hook, line & sinker. And it makes for a great late night blogging snack! Oh so yummy looking! They looks so tender and moist – Yum!! Yes, yes, and HECK yes to these bars! They look amazing and I’m totally digging your pics. Wish you lived next door so I could pilfer some of these. Whoa, really? So was I! Ugh, whyyyy didn’t I see you!? Holy blueberries! Loving all that blueberry goodness oozing out, they look so good! And eww, an abandoned tooth? That’s just wrong! Streusel is one of the best things ever. And blueberries are one of the best fruits ever. And YOU are one of the best bakers ever, so I’m gonna go ahead and assume these taste as awesome as they look. And ew on the bloody tooth. Sick. I’d happily survive on fro-yo and fro-yo alone for the rest of my life!! Preferably cake batter flavored fro-yo!!! Anyway, I love these Hayley! Streusel should beits own food group. I’d sprinkle streusel on my fro-yo meals. 🙂 Love the cake mix, too!! You’re the CAKE MIX QUEEN!!!!!!!! I also wonder about the pan size. Attempt #1 I baked an extra four minutes but I was afraid of over baking, so I pulled them out. Big sloppy mess. Attempt #2 is in the oven now (with a white cake mix since I didn’t have another yellow on hand), and it’s been 23 minutes and they still aren’t set. Time for a modification? Hi Stephanie! Looks like I’ll need to redo this recipe since there are problems with its execution — I apologize for the failed attempts! I’ll try to recreate it soon so I can see if there’s an issue on my end with timing, etc. Thanks for the heads-up! Same experience. Cooked it about 10 minutes longer but was afraid of over cooking per the instructions. I may try it again today, in a bigger pan and adjust what I need to do with the cooking time. Concept and taste was good, just needs to be thinner. Hi I just made the recipe and the result is wait let me taste, drum roll ,please this is so good and still warm nice and gooie in the middle and crunchy on the top . I really liked this recipe will make again.